Financial fraud is a subset of fraud focused on schemes of monetary and asset categories. “Fraud involves all deceptive ways in which one individual obtains an advantage over another by false representations. Fraud always involves confidence and trickery. Fraud is different than robbery where force is used” (Albrecht et al., 2012, p. 9). Fraud comes in a myriad of forms that typically comprise an element of the “Fraud Tree” developed by the Association of Certified Financial Examiners (ACFE). The three broad categories of fraud are 1) Corruption, 2) Asset misappropriation, and 3) Financial Statement fraud. Of the three types, financial statement fraud causes the greatest losses to businesses, but only occurs in 9% of occupational fraud cases (ACFE 2014). Asset misappropriation is the most common form of fraud and results in the lowest relative costs to a business (ACFE 2014). What motivates people to commit fraud? People are motivated to commit fraud for a wide variety of reasons that generally fit into three categories: 1) financial pressures, 2) opportunity, and 3) rationalization. These categories are known as the elements of the fraud triangle. “Nearly every fraud involves the element of rationalization. Most fraud perpetrators are first-time offenders who would not c ommit other crimes” (Albrecht et al., 2012, p. 50). The ACFE has compiled a comprehensive list of frequently occurring behaviors among those who commit fraud that can be used as a profile for both men and women. Some of the most frequent motivations for committing fraud are: 1) Living beyond their means, 2) Financial difficulties, 3) Close associations with vendors/clients, 4) Excessive gambling habits, 5) Divorce and family problems. What types of people commit fraud? Putting together an accurate profile of someone who commits fraud is difficult as most perpetrators are first time offenders who have never committed a crime before. Analyzing the cases of those who have been convicted of fraud indicates that twice as many men as women commit fraud and men cause much higher fraud losses than women (ACFE, 2014, p.74). Fraudsters range across all ages, all positions in organizations, and all levels of tenure within an organization. Neither the age of the employee, time in the organization, nor position of employment eliminate the risk of an individual to commit fraud. The frequency, cost, and distributions by age and tenure are shown on the charts created by the ACFE are current through 2014. While older employees are less likely to commit fraud, their crimes tend to create substantially larger losses for the organization. What are some of the methods in which people commit fraud? The methods used to commit fraud vary significantly by industry just as the pressures, opportunities, and rationalization of the perpetrators vary. As the chart from the ACFE below shows, the categories of fraud schemes vary greatly by frequency and median loss to an organization. Financial statement fraud represents by far the highest median loss to an organization despite being ninth most frequent type of fraud committed. Within financial statement fraud schemes some of the categories of fraud include: 1) Revenue recognition, 2) Timing, 3) Fictitious and inflated revenue, 4) Misclassification, 5) Improper capitalization, 6) Asset valuation, 7) Fair value accounting, 8) Shifting expenses, 9) Omissions and under reporting of liabilities, 10) Consolidations and business combinations, and 11) Disclosure fraud (Zack 2013). Why is the fraud triangle important? The fraud triangle is an important aid to assist in determining the levels of risk present with an individual, a job function, or more broadly across an organization. The triangle was first developed by Dr. Donald Cressey based on research of 200 people incarcerated for embezzling funds. 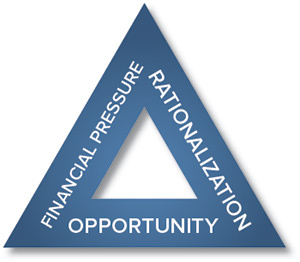 Originally known as Cressey’s hypothesis of “trust violators’” motivation, it eventually was called the fraud triangle. All three of the elements must be present in order for fraud to be committed (ACFE 2015). “Without an opportunity the other two components (pressure and rationalization) may exist in vast quantities and there would still be no fraud because the individual would not be able to commit fraud without opportunity” (Nigrini, 2011, p. 449). What are some of the controls that prevent or detect fraudulent behavior? Controls to prevent or detect fraudulent behavior are numerous and vary by industry and job function. The most commonly occurring controls are shown on the chart below. Topping the list are external audits of the financial statement, followed by codes of conduct, internal audit departments, and management certification of financial statements. While tips have been found to be the most effective way to locate fraud, hotlines and rewards for whistleblowers are still poorly and infrequently implemented. According to the ACFE, tips represent more than 40% of all detected fraud, followed by management review (15%), internal audit (14%) and by accident (7%). Confession and IT controls are listed as the two least likely ways to initially discover fraud in an organization. Training employees about fraud prevention and strongly encouraging whistleblowers is a powerful deterrent. How does rationalization contribute to fraud? Rationalization provides the fraud perpetrator with a psychological justification for taking actions they know to be wrong. The reasons are varied and typically include rationalizations like: “1) The organization owes it to me, 2) I am only borrowing the money and will pay it back, 3) Nobody will get hurt, 4) I deserve more, 5) It’s for a good purpose, 6) We’ll fix the books as soon as we get over this financial difficulty, 7) Something has to be sacrificed – my integrity or my reputation” (Albrecht et al., 2012, p. 50). When Dr. Cressey analyzed the embezzlers in his study he found that in all cases that the violator believed their problem was non-sharable even with people who likely could have solved their problem lawfully (ACFE 2015). Association of Certified Fraud Examiners. (2015). CFE Exam Review Guidebook: Fraud Prevention and Deterrence. Austin, TX: ACFE. Association of Certified Fraud Examiners. (2014). Global Fraud Study: Report to the Nations on Occupational Fraud and Abuse. Austin, TX: ACFE. Albrecht, W. S., Albrecht, C. O., Albrecht, C. C., & Zimbelman, M. F. (2012). Fraud Examination (4th ed.). Mason, OH: South-Western, Cengage Learning. Nigrini, M. J. (2011). Forensic Analytics: Methods and Techniques for Forensic Accounting Investigations. Hoboken, NJ: John Wiley & Sons. Zack, G. M. (2013). Financial Statement Fraud: Strategies for Detection and Investigation. Hoboken, NJ: John Wiley & Sons.